GeoProtect W16BW/BB, W20BW/BB and W30BB are woven coated fabrics made of oriented high density polyethylene ribbons and outer layers of a resilient UV stabilized coating. 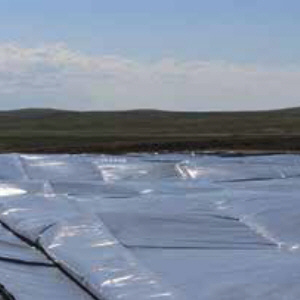 GeoProtect reinforced polyethylene materials have an incredibly high strength-to-weight ratio, resulting in superior tear resistance and ease of installation. Available in 16, 20, and 30 mils, White / Black and Black / Black. Click here for Product Data sheets.